The Science Museum Flight Gallery is really something special. I never realised that the museum contained a gallery which is built like a real aircraft hanger and which contains some of the best examples of human flight. London Museums never seem to cease to surprise me and this Flight gallery is a great example of coming across something which makes you stop in your tracks. The Flight gallery can be found on the Third floor of The Science Museum and if aeroplanes and flight is one of your special interests I would recommend you visit here first rather than waiting till you get to the third floor. You don't want to be too tired to really enjoy this gallery. This video is a walk though along the gantry level where many of the aircraft can be seen at eye level. Spitfires and Hurricanes - the gallery contains one of each and as many know these type of aircraft played a vital role in the battle of Britain during world war two. 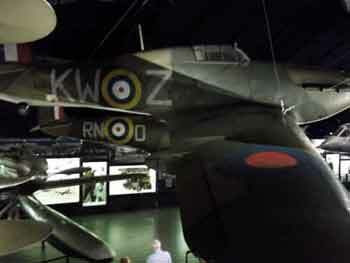 In fact the Hurricane on display actually took part in the battle over Dunkirk. This hurricane is an early model and still has material covering the wings rather than having metal ones. Which harps back to earlier aircraft design which were constructed from wood, material and string. Close by is a Stuka which was the main adversary for the Spitfire and the hurricane during the war. The Stuka was very sophisticated and was perhaps one of the main driving force behind the major improvements of the British airplanes of the time. Hawker P1127 - This looks like a modern Harrier jump jet but is in fact its predecessor prototype. It dates to the 1960's and was the first aircraft to achieve vertical takeoff. This is a very impressive aircraft and although surprisingly small still manages to be one of the galleries most popular exhibits. It is suspended in the hall with its thrusters in the hover position, giving the impression that it is hanging there all by itself. Section of a Boeing 747 _ you can't fail to notice the giant cut out section of this passenger plane at the end of the gallery. At first glance you could think it was the open jaws of a giant whale, but on close inspection it becomes apparent that it is a slice taken from the plane. The 747 was more commonly known as the jumbo jet and is still in use today. This particular section comes from a plane which was built in 1974 and since that time many improvements have been made. Although this used to be the largest passenger plane in use it has since been surpassed by the recent introduction of the airbus. Montgolfier Balloon - As you the enter the Science Museum Flight gallery one of the first things you will see is a replica of the first public demonstration balloon by the Montgolfier brothers in 1783. Although this balloon did not take passengers it showed that balloon flight was possible as during the demonstration it managed to climb to 6,000 feet and stayed in the air for 10 minutes. The balloon was made from material and paper and is highly decorated. I am an avid museum visitor as you can guess so I am often not in awe at what is on display. However I must say that as I walked into this aircraft hanger which was dimply lit with spot lights picking out the exhibits I think I may have had my mouth open. the way the gallery has been laid out is really visitor friendly. There is a high walk along gantry which takes you though the gallery where you can see the hanging aircraft exhibits at eye level, the ground floor is open plan and allows easy access around the exhibits even if you have a pram or wheelchair. There is a smell of oil in the air which I suppose comes from the aircraft themselves, this adds to the experience of being around some amazing pieces of machinery. Although I am not that much into aircraft and engines this gallery managed to get me to find out more about each display. Even the racks of engines which too all intense and purposes is just a lot of engines was really interesting as many of these played a major role in aircraft design and development. As well as actual aircraft and engines the gallery also contains many smaller items such as Medals, flying helmets and masks, aircraft models and flight related gift items such as decorated snuff boxes and teapots. I enjoyed this gallery very much and I would definitely say that during your visit to the Science Museum this should not be missed.